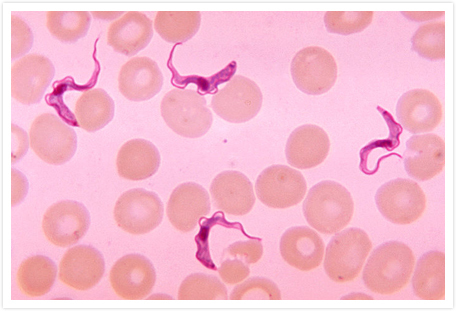 Human African trypanosomiasis is caused by microscopic parasites of the species Trypanosoma brucei. It is transmitted by the tsetse fly (genus Glossina). As the disease progresses, it causes meningoencephalitis and, eventually, coma and/or death, hence its common name, “sleeping sickness.” It is estimated that 60–70 million people in 36 sub-Saharan African countries are at risk of infection. Also known as sleeping sickness, African trypanosomiasis is caused by a microscopic species of parasites known as Trypanosoma brucei and is spread by the tsetse fly (Glossina). Very rarely, however, infections via mother to child, blood, and sexual activity are also observed. The two types of African trypanosomiasis are named for the regions in Africa where they were found historically: East African trypanosomiasis (Trypanosoma brucei rhodesiense) and West African trypanosomiasis (Trypanosoma brucei gambiense). Incidentally, West African sleeping sickness mainly infects people, while East African sleeping sickness can infect wild animals and cattle. Symptoms in the early stage are relatively mild and may include fever, headache, and muscle and joint pain. However, mental impairment, seizures, and difficulty walking can also manifest in cases where the parasite crosses the patient’s blood-brain barrier and into the central nervous system. If left untreated, the infection worsens, and death may occur in several months to several years. Both East and West African sleeping sickness are accompanied by the following symptoms. After the first infection, people can be repeatedly re-infected. Ninety eight percent (98%) of sleeping sickness in Africa is West African sleeping sickness. Early symptoms include lymphadenoma, headaches, intermittent fever, and muscle swelling, none of which are specifically attributable to African sleeping sickness. However, distinct symptoms appear when the infection reaches the central nervous system, including personality change, mental impairment, and seizures. If untreated, it can kill within three years. East African sleeping sickness accounts for less than 2% of all cases of African sleeping sickness. Normally the disease develops rapidly, showing the first symptoms within a few weeks of infection. In some cases, symptoms may include a large sore (chancre) on the area bitten by the tsetse fly. Unless treated in the early stages of infection, the parasite will invade the central nervous system within a space of few weeks. Death usually occurs within several months. For both the West and East African variants, the first step is to conduct blood and other tests. A microscope is used to confirm the presence of the agent. Since it is difficult to discern cases of West African sleeping sickness due to the scarcity of the agent, a lymph fluid test of swollen lymph nodes (posterior neck) and other tests are also necessary. Since different drugs should be administered depending on whether or not the central nervous system is involved, all the patients diagnosed with African sleeping sickness have to undergo a cerebrospinal fluid test. Pentamidine, a drug given intravenously or via intramuscular injection, is used to treat first-stage African sleeping sickness. Suramin is also effective, but since severe adverse reactions can occur in cases where the patient is also infected with Onchocerca volvulus (cause of river blindness), it is not normally used. Eflornithine, which is administered intravenously four times daily for two weeks, is used to treat second-stage West African sleeping sickness, including in cases where the patient exhibits advanced symptoms of the disease. Although eflornithine is highly effective, it is difficult to administer frequently in clinics and hospitals in rural Africa. For this reason, there has been a tendency to reduce the frequency of eflornithine and, instead, use eflornithine in combination with nifurtimox. Suramin is used to treat first-stage East African sleeping sickness. Although suramin can frequently cause adverse reactions, these are usually mild and reversible when the treatment is stopped. Melarsoprol is currently the sole drug available for the treatment of second-stage East African sleeping sickness, but adverse reactions to this treatment can be severe and even life-threatening to patients. In 5–10% of patients given melarsoprol will develop an encephalopathic reaction, resulting in a fatality rate of approximately 50%. To reduce the risk of encephalopathy, however, prednisolone can also be administered to patients being treated with melarsoprol. Other adverse effects observed in melarsoprol treatment include skin reactions, gastrointestinal upset and peripheral neuropathy. For these reasons, melarsoprol should be administered with caution. Currently, there is no vaccine or medicine that can prevent African sleeping sickness. Therefore, it is all the more important to avoid contact with tsetse flies. Given the tsetse fly’s characteristic behavior, preventive measures should include not wearing bright-colored or extremely dark-colored clothes, and staying away from bushes where tsetse flies live during daytime. Infections of both West and East African sleeping sickness have been reported in rural villages and on the plains of sub-Saharan Africa. West African sleeping sickness is found in 24 countries in West and Central Africa. More than 95% of cases are reported from the Democratic Republic of Congo, Angola, Sudan, Central African Republic, Chad, and northern Uganda. East African sleeping sickness is found in 13 countries in eastern and southern Africa. 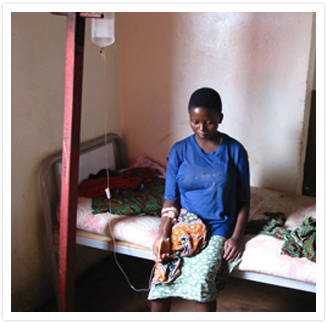 More than 95% of cases are reported from Uganda, Tanzania, Malawi, and Zambia. There were some 7,000 new cases of African sleeping sickness in 2012. In recent years, the number of reported patients has declined sharply. It is estimated that some 60 million people in 36 sub-Saharan African countries are at risk of contracting African sleeping sickness. When left untreated, the mortality rate of African sleeping sickness is close to 100%. It is estimated that 50,000 to 500,000 people die from this disease every year. By the 1920s, sleeping sickness epidemics were being controlled by mobile teams who screened the millions at risk. By the mid-1960s, it appeared that the disease had almost disappeared. However, the disease has reappeared in several areas over the last 30 years. Programs from WHO (World Health Organization), national control programs, as well as bilateral cooperation and the work of nongovernmental organizations (NGOs) during the 1990s and the early 21st century have reversed the increase in new cases. Thanks to these efforts, in 2009 the number of reported cases of sleeping sickness fell to below 10,000 for the first time in half a century, and in 2015 there were 2804 cases recorded. In the same year, WHO established a specimen bank to aid development of new and more-easily affordable diagnostic tools for sleeping sickness. The bank holds not only blood and serum samples but also stores and keeps records of cerebrospinal fluid, saliva and urine from patients infected with either forms of the disease as well as from uninfected people in endemic areas. WHO set the goal of eradicating African sleeping sickness by 2020. In 2001 Sanofi signed a partnership agreement for 5 years with WHO, renewed in 2006 and 2011, to donate drugs for human African trypanosomiasis and to provide financial support to ensure that they could reach the patients who needed them, at no cost to the patient, and thus ensure that they could receive treatment for this otherwise generally fatal disease. As a result of this partnership, since 2001, 27 million people have been screened for sleeping sickness and more than 175, 000 patients have been treated. As of 2015, Sanofi is committed to continually provide for free three of the drugs used for the treatment of sleeping sickness until 2020. At the same time, Sanofi supports the distribution of drugs to make sure that they reach the patients who need them. Sanofi, in partnership with the Drugs for Neglected Diseases initiative (DNDi) foundation, has started developing a new oral drug for human African trypanosomiasis, fexinidazole, to further support the improvement of the management of this disease. Bayer will continue donating pentamidine until 2016 via WHO. It is also committed to continually provide free suramin and nifurtimox until 2020. The above pharmaceutical companies, in partnership with DNDi, have presented their chemical compound library (a large number of chemical compounds used for research and development of new drugs) to assist in the development of new drugs for Human African Trypanosomiasis. Why do zebras have beautiful patterned stripes all over their bodies? According to the latest research* from the University of California, Davis, it is suggested that zebras evolved to have stripes in order to ward off biting flies such as the tsetse fly, which is a vector for African trypanosomiasis. 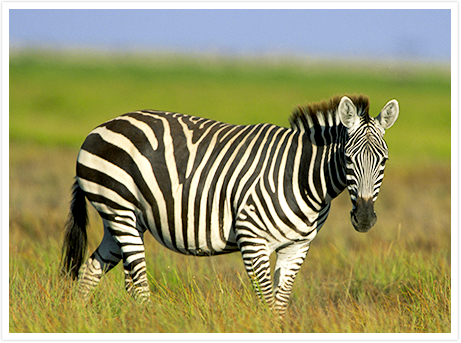 Compared to other species of horses living in Africa, it is known that zebras rarely contract African trypanosomiasis. Also, despite the geographic distribution of zebras greatly overlapping with the geographic distribution of tsetse flies and horseflies, which are two varieties of biting fly, it is reported that the blood of zebras is rarely found inside tsetse flies. Furthermore, it has been shown through experimentation that although biting flies will land on a surface which is evenly colored, they tend to avoid a surface with a striped pattern. So in this way, it is quite possible that zebras evolved to have beautiful stripes all over their bodies in order to avoid being infected with African trypanosomiasis.